The Lymington Society has already written a letter of opposition to the proposed development. Since then we have been able to read the views of the Lymington and Pennington Town Council and also the views of the Officers in relation to this application. On behalf the Lymington Society I agree with all these views. It is self-evident that a development of this size will have a significant impact not only on the general character of the neighbourhood, but also on its neighbours. There is an argument to say that, wherever this development was placed it would be out of keeping with its surroundings and the interests of its neighbours. The main concern of the Lymington Society in relation to this development is that is being proposed in an area which has a significant impact on the character of Pennington and Lymington. I am sure you are all very well versed in the Local Distinctiveness Supplemental Planning Guidance, which have been developed for various areas of the New Forest. Our particular concern is with that for Lymington and Pennington, which was adopted in 2011 after discussions between the New Forest District Council, the Lymington Society and various other bodies. “The busy Milford Road includes a variety of large suburban houses and bungalows each in a large garden setting, often containing forest sized trees. This road is perceived as a green corridor largely as a result of the large gardens, frontages furnished with trees and hedges and wide green verges. These elements are important and must not be allowed to become unduly compromised by gradual loss of garden space, incremental loss of hedges, or loss of verges through additional driveway crossovers or further hard surfacing”. That quotation sums up the essence of what the Lymington Society has been trying to preserve in the approaches to Lymington, including Southampton Road and Avenue Road. Lymington and Pennington are lucky that until the last 10 or 20 years there has not been any significant pressure to redevelop the largely detached houses standing in their own gardens, which line these roads so that these roads take the traveller right up to the entrances to the Georgian high street, without having to pass that barrier of modern office and residential blocks which characterise so many other towns. The Lymington Society fought hard to preserve the character of Southampton Road and Avenue Road. For some reason the character of Milford Road has not been under threat until recently. Obviously there is the long-standing functional development of the shopping arcade at Foxpond which serves a necessary purpose. The Belmore Lodge development was justified as being a corner site setback in its own grounds and with an Art Deco style to it. However to go further and permit further redevelopment of detached houses next to Belmore Lodge and indeed anywhere up to Priestlands Place at the entrance to St Thomas Street and the High Street would start to tip the balance of the character of Milford Road away from that of a green corridor. I say that not only in relation to this location, but also locations on Milford Road closer to Lymington, which developers might think would be ripe for redevelopment of this nature. There is no doubt that any town requires a mixture of housing of which residential units for the elderly are one category. Obviously, such residential units will free up other residential units required for families and young people and there may well be places in Lymington, where they are appropriate, and the North Close development on a brownfield site has turned out to be a good example of that. There must be other sites which could accommodate such a development without affecting the local character and the local distinctiveness, so clearly set out in the local distinctiveness supplemental planning guidance. I appreciate that as a planning committee you cover the whole of your planning area but I am sure that you will look at each locality, according to its own character and the character of that area which has been adopted by your Council in its appropriate supplemental planning guidance. I am writing to you to advise you that the Committee of the Lymington Society has decided to oppose the inclusion by the NFDC of a site off Lower Pennington Lane for a major housing estate (for a minimum of 100 houses), as part of the “Local Plan Review” which the NFDC have recently published as part of a consultation exercise which ends on the 12th of August. The Lymington and Pennington Town Council are also opposing this proposal. We have reached this decision after careful consideration of the site and having reached the decision that the roads to the site are not capable of safely carrying the level of traffic this proposal will generate, without significant widening and suburbanisation, which would destroy the special semi-rural character of this important part of the town. The special character of this part of the town is supposed to be protected by the Lymington Local Distinctiveness Supplementary Planning Guidance put in place by the NFDC and if this is set aside to allow this development to go ahead, then it will be increasingly hard to protect the special character of the town against the increasing level of development pressure which is evident at the moment. We have also added links to the NFDC Consultation on the LymSoc website to help you make your own representations to the NFDC before the deadline at midnight on the 12th of August. The NFDC consultation page can be found here. It includes a link to a representation form which can be filled in if you wish to comment. The Lymington Society has lodged an objection to the plan before the NFDC for a development of 31 retirement flats in Milford Lane, Pennington, near to Belmore Lodge. Our data Protection statement has been updated to include the Friends of Sir Harry. Please see the data protection page under “The Society” in the website menu for the updated statement. Around 40 members and guests were able to enjoy the beautiful gardens of Chawton House Surgery for the Lymington Society Annual garden party The weather meant members could wander amongst the garden and admire the planting which gave the garden a mature feel with many specimen plants to view . Members were treated to wine prosecco and some delicious canapés The society are very grateful to the partners at the Surgery for allowing us to use their picturesque gardens . Nicki Balfour Penny gave a truly fascinating talk to around 30 members of The Lymington Society on the Shell Heritage Art collection . In her presentation Nicki explained that the collection is still owned by Shell but kept on view at the Museum where she is the archivist . Nicki gave a chronological walk through the collection starting with the early postcards used for advertising and highlighting some of the social issues of the day such as Votes for Women . Members were surprised to discover that the advertising also featured Valentines cards and even early silent films . The posters themselves provided a unique insight into the social history of the twentieth century from the early 1900s to 1970s. 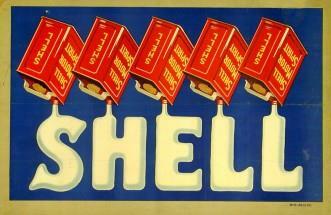 Nicki emphasised the importance of Shell’s director of advertising Jack Beddington, who in the 1930s was successful in commissioning some of the country’s best artists to design poster collections such as “Visit Britain’s Landmarks”, Prefer Shell, and “ Everywhere you go “ among others This has made the collection not only a showcase for the social history of the time but has helped highlight the early works of artists such as Ben Nicholson, Paul Nash, Vanessa Bell , Rex Whistler , Graham Sutherland, Edward Kauffer and Hans Schleger. Members were also interested to learn that Shell compiled a series of Travel Guides edited by John Betjeman which were made into short films, and broadcast in black and white on TV. There were also a series of poster on nature topics which were used in school in the sixties. Indeed it became clear that the collection is foremost a great treasure trove of commercial art rather than just a series of adverts. We note with great sadness the recent death of Lt-Col Peter Chitty, who played such a significant role in the Lymington Society.